Limelight® No. 7 in 20cl. This is the standard glass tumbler size that you’ll find on the high street, with a burn time of up to 40 hours. 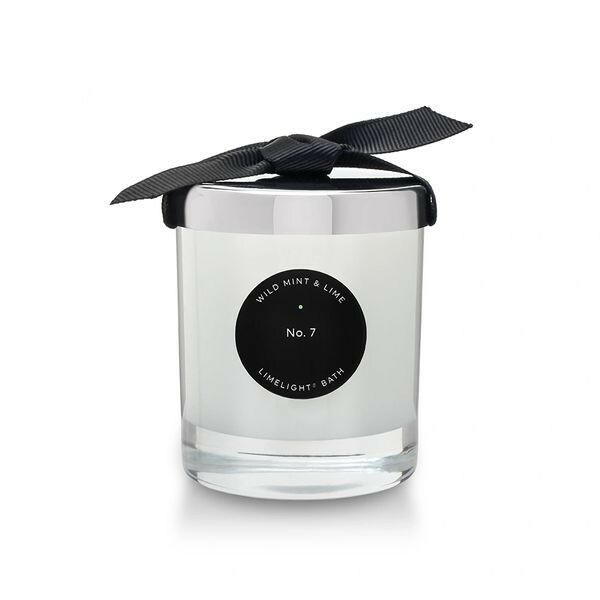 This candle comes with a silver lid, wrapped in black tissue and beautifully boxed in a black box with black grosgrain ribbon. Weight 400g (dimensions 8 cm x 7.6cm). Limelight® No. 7: Wild mint and lime citrus, this is one of our favourites. Mint is a natural stimulant, re-charging our batteries and giving a boost to our mental alertness. This is a fabulously uplifting scent, taking us back to happy holidays in Kefalonia. It's the ultimate candle for the study and for children when they are revising. This might become our new favourite.